Ground explored the dichotomy of internal and external spaces within a body. 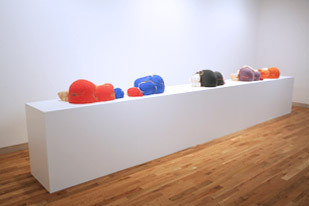 Exhibited at the James Harris Gallery, five sleeping figures formed a colorful, private mound on the floor, their bodies curled inwardly and their faces towards the wall. Sleeping Woman in a Black Dress has her eyes closed, but the other four women float between consciousness and dream states. A drawing, Summer Dream, from woodcut, lithography and chine-colle, portrays another sleeping woman. Alone in a separate room and facing away from the entrance, the figure of a child squats defiantly, both exposed and hidden in her own thoughts and body.